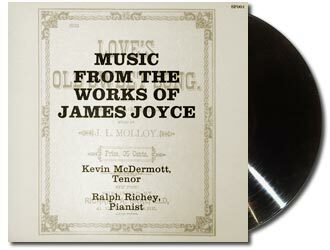 These CDs contain performances of music composed to James Joyce's own words as well as period songs mentioned by him in his books. Use the buttons below to add these items to your PayPal Shopping Cart. Note that only New York State tax-exempt organizations can order from this page! If you are not a tax-exempt organization, please order from this page. COLLECTOR'S EDITION — ON SALE TODAY — SAVE $10.00!!! 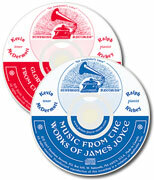 We have just discovered a small trove of unopened, unplayed 33 RPM albums of MUSIC FROM THE WORKS OF JAMES JOYCE. Fans of vinyl will appreciate this rare find! These are the last known copies of the original 1982 LP recording, and they are in mint condition. With the exception of the four bonus tracks ("The Bloom Is on the Rye," "The Low-back'd Car," "The Croppy Boy," and "Sweet Rosie O'Grady"), the track list on this record album is the same as that of the 2004 CD re-release. Supplies are limited, so order today! 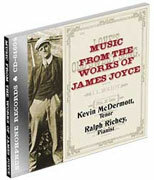 These albums contains performances of music composed to Joyce's words and period songs mentioned by him in his books. On this site you can preview the music before buying or learn more about the contents of the albums. The price of each CD is US$12.95 plus shipping & handling. 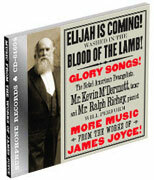 Save money by ordering the 2-Disc Set!